Updated: The Palestinian Health Ministry in Gaza has confirmed, Friday, that a young man was killed, and at least 969 Palestinians have been injured, by Israeli army fire, along the eastern border areas, in several parts of the Gaza Strip. 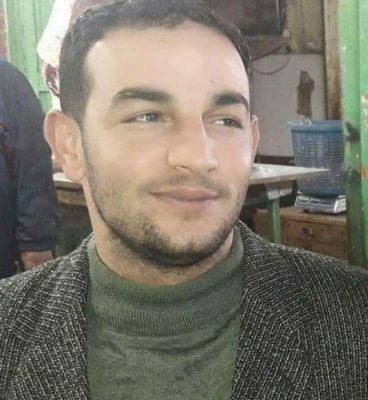 Dr. Ashraf al-Qedra, spokesperson of the Health Ministry in Gaza, said the soldiers shot Islam Herzallah, 28, with a live round in the abdomen, east of Gaza city. The young man was rushed to the Shifa medical center in Gaza city, where he succumbed to his serious wounds. 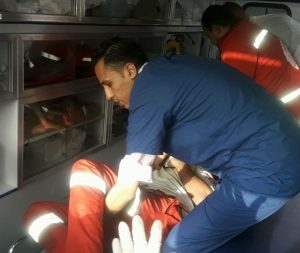 Dr. al-Qedra added that the young man was shot east of Gaza city, and received the urgently needed treatment in a field clinic, before he was transferred to the medical center where he was rushed to surgery but succumbed to his serious wounds. He also said that the army injured 969 Palestinians near border areas Rafah, Khan Younis, al-Boreij, east of Gaza, and east of Jabalia. 419 of them were moved to hospitals and medical centers, and 550 received treatment in field clinics and make-shift hospitals near border areas. Among the wounded Palestinians are seventeen medics, after the army deliberately targeted field clinics with gas bombs, east of Khan Younis, in the southern part of the Gaza Strip. 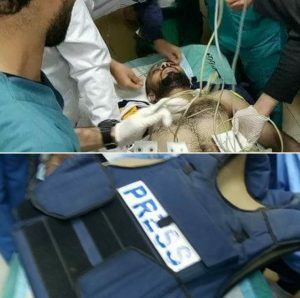 The army also seriously injured a journalist, identified as Ahmad Abu Hussein, who was shot in the abdomen, and moderately injured another reporter, Mohammad Najjar, who was shot in the shoulder. Many other journalists fainted after inhaling gas fired by the army, especially when army drones fired gas bombs at media vehicles and reporters. Herzallah’s death brings the number of Palestinians who were killed by Israeli army fire since March 30th, to 36 Palestinians. 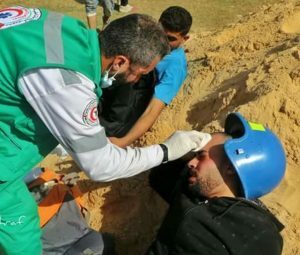 The Palestinian Health Ministry has reported that Israeli soldiers injured, Friday, seventeen medics, after the army deliberately targeted field clinics with gas bombs, east of Khan Younis, in the southern part of the Gaza Strip. 701 Palestinians injured by army fire in the Gaza Strip. The Ministry stated that the army targeted the clearly marked field clinics, causing seventeen medics to suffer the effects of tear gas inhalation, along with dozens of Palestinians, who were receiving treatment there. It said that the medics will always provide the needed treatment to all wounded Palestinians despite the ongoing and escalating Israeli violations against them, in direct violation of International Law. The Ministry also called on the international community to take a decisive and firm stance condemning Israel’s escalating violations, and to provide the urgently needed protection to the Palestinian people, and to ensure an end to the violations against the medics and all medical facilities. It stated that the seventeen medics were among 701 Palestinians, including journalists, who were injured by Israeli army fire. 163 of the wounded Palestinians were shot with live ammunition. 296 of the wounded were rushed to various hospitals and medical center in the coastal region. Among the wounded is a journalist identified as Ahmad Abu Hussein, who was seriously shot in the abdomen, and Mohammad Najjar, who was shot in the shoulder.